As a remote oceanic island, St Helena is very vulnerable to the introduction of new pests, weeds and diseases which can adversely affect agricultural production, the natural environment, and also human and animal health. Protection against harmful introductions is managed by the biosecurity service, Biosecurity St Helena. There are strict controls on what you can bring in to St He lena when arriving on Island. 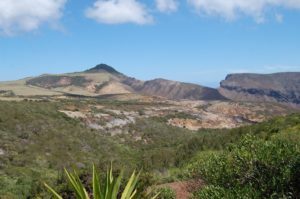 This is to ensure the diverse and unique environment of St Helena is preserved and encouraged. Everyone benefits from a strong biosecurity system so everyone has a role to play. In order to protect the Island please note the following restrictions on the personal effects you can bring in. It is against the law to import honey. Honey isn’t processed and can carry bee diseases such as American foul brood, as can many other unrefined bee related products and used bee equipment. St Helena at the moment has very few bee diseases and local bee keepers are trying to develop honey production. There are restrictions on some meat and fish products. Please declare any such items to Customs or Biosecurity. In addition, dirty boots and shoes can carry weed seeds and harmful plant diseases which can damage the islands agriculture or native plants and animals. Please ensure that your footwear is clean before landing. Goods and personal effects entering St Helena are inspected on arrival using a combination of detector dogs, x-ray machines and visual checks. Any prohibited or restricted goods found will be seized. If you have inadvertently brought in such goods please hand them over to a Biosecurity Officer or place them in the quarantine bin in the Arrivals Hall. A short video can be found here which explains the importance of biosecurity to St Helena.